Turn right on Bowie, and stop at West Schubert Street. The Tatsch Haus, made from local stone by John Peter Tatsch in 1856, is one of the most widely known historic homes in Fredericksburg. Tatsch was a “Tischler” or cabinetmaker and turner. The front two rooms are the original section of the house with the kitchen, fireplace and oven being added later. 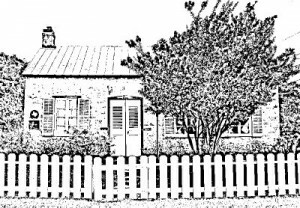 In 1965 the house was dedicated with a Texas Historic Landmark located on the front of the house. This home is a favorite subject for many history books and detailed floor plans can be found in the Library of Congress. The authenticity of this pioneer home gives you a true feeling of what life was like in Fredericksburg. The large double wooden doors lead into the bedroom where a double size bed owned by Richard Tatsch was the family’s pride and joy because of the fact it was “factory made”. The living room is adjacent to the bedroom. An inside stairway was a real novelty in its day as most homes only had outside stairways. An authentic kitchen has the original fireplace and cooking pots demonstrating how cooking was done….including a baker’s oven–now sealed. The shutters and the back door are solid with no openings or outside handles designed as a safety measure against the Indians.